Ann Whitford Paul is a wonderful author of picture books, with titles like "Word Builder" and "Tortuga In Trouble" as well as the picture book craft book, "Writing Picture Books: A Hands-On Guide from Story Creation to Publication." And in an op-ed piece "A Transgender Story: My Daughter, My Son" in the Los Angeles Times this week, Ann writes about her child's journey from Sarah to Finn... and her own challenging journey of acceptance. 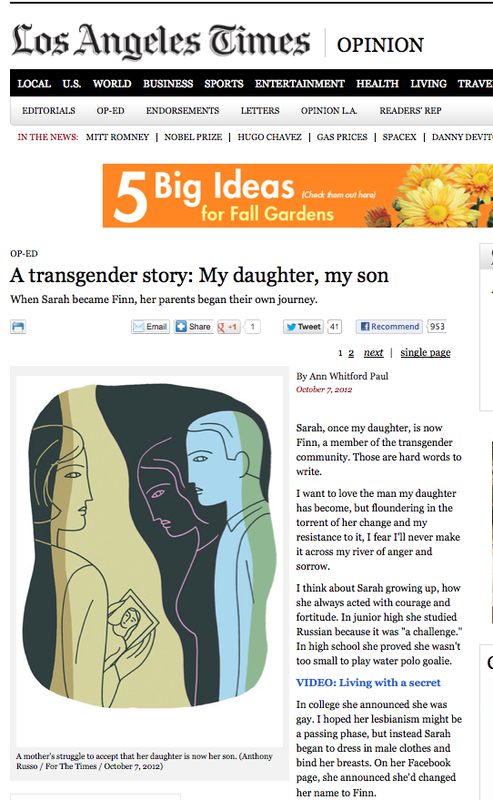 It brought me close to tears, and I'm so proud of Ann for sharing her story and standing up for her child!